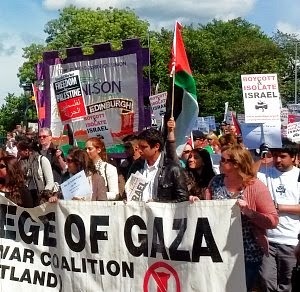 On the 90 minute march, people carried a card, each with the name of one of the 2,000 Palestinians, almost 400 of them children, killed by Israeli forces. It was a poignant and powerful way of highlighting the human cost. 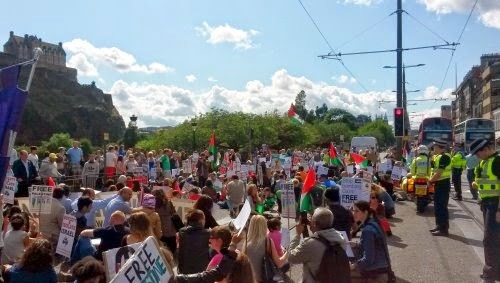 The demands were straightforward: An immediate end to the killing, Israel to lift the siege and to abide by UN resolutions. 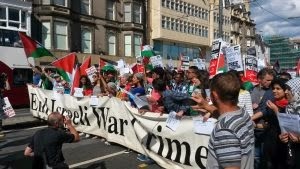 An end to arms sales to Israel and boycott, divestment and sanctions to bring pressure on the Israeli government. A free Palestine. Sadly, the only union banner on the march was UNISON Edinburgh’s but it was met again with great warmth and welcome after welcome from members, non- members and even those who just wanted to know what UNISON was. 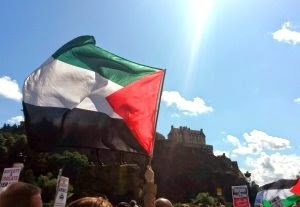 Glasgow, West Dunbartonshire and Fife won applause for flying the Palestinian flag and calls were made for Edinburgh to do the same. 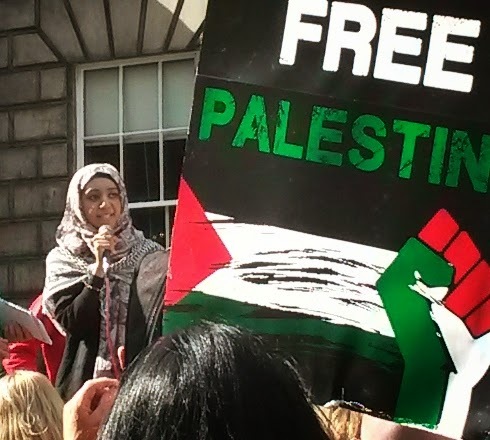 But, as the news came through of the massive demonstration in London, it was the moving speech by ‘Glasgow Girl’ Amal Azzudin outside Bute House that brought the biggest response from the rally. “It is a failure of power! People power is stronger than those in power. We are the 99%. Humanity is the 99%”. In a speech of emotion, passion and eloquence, Amal urged people to demonstrate again and again until their voices are heard.